Is Swagbucks Worth the Time? Do a Google search for “best ways to make money online” and you’ll see Swagbucks come up in numerous results. I’ve also seen it recommended on many different money-related blogs as well. But is it really a wise use of your time and attention? Launched in 2008 and based in California, Swagbucks is known for providing rewards redeemable for gift cards in exchange for performing online activities such as completing surveys, browsing the web, viewing marketing content, and shopping (they have a cash back feature similar to sites like Ebates). As the 414th most-visited site in the U.S., it’s likely you’ve heard of it. Aside from their cash back shopping feature, which is fine (I sometimes use it), Swagbucks’ surveys and money-making opportunities pay extremely little. After a few lamentable hours of participating in a dozen or so of their surveys, clicking the play button and clicking through their two-cent movie trailers and commercials, I earned a measly dollar and reached the conclusion that the site is a near-total waste of time. Their surveys generally pay around $1.20 an hour (1 SB = $0.01). Quite a dreary wage is for someone living in the U.S.
You can make up to 500 SB per day by watching videos. You make 3 SB (the equivalent of $0.03) for every 20 videos. It seems they can be anywhere from 30 seconds to five minutes or so. You have to manually click to play the next one—it doesn’t just automatically go to the next video. That means for about every 666 videos you watch, you’ll make $1. To make $15, you’d have to watch about 9,990 videos. And yet, I’ve heard time and time again from people that they enjoy making money from this feature. Jumpin’ jeepers. I also found some of their surveys, offers, and email marketing tactics deceptive and shady. As an example, I spent at least half an hour filling out one that seemingly would never end. Having had invested so much time, I felt it was too late to exit so I kept slogging through (I fell prey to the sunk cost fallacy). Eventually the survey seemed to reach its end, but there was no completion page; it was just blank. Later I opened a ticket with Swagbucks but didn’t recall the name of the survey or its value, nor had I documented taking it, so they couldn’t do anything. 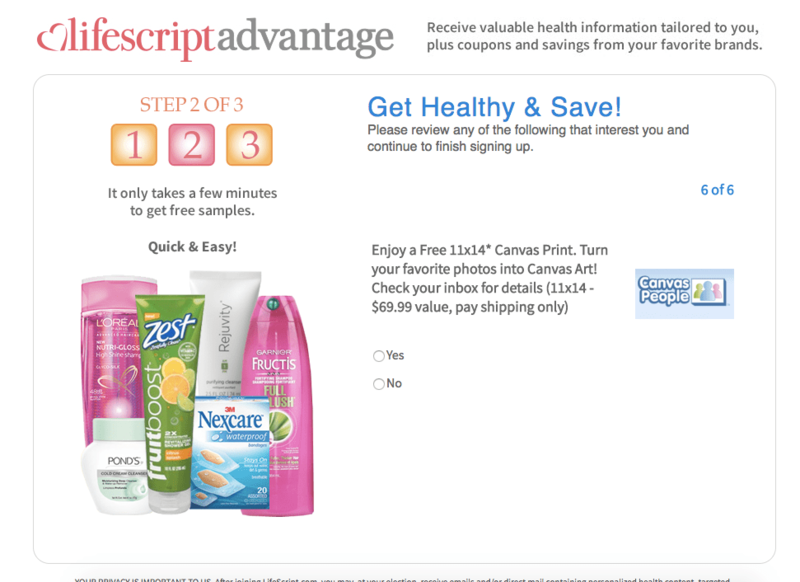 Another Swagbucks offer promised 25 Swagbucks (equivalent to 25 cents) for signing up to receive a sample of Zest body wash. Not a bad deal, right? Well after entering my address, name, email, and a completing a checklist of health-related questions, I was cycled through a never-ending series of sign-up offers. The form displayed that I was at offer 1 of 6, and so forth, but after entering “no” to offer six, it took me to question 1 of 12, and just kept cycling through the same ones. The case seemed to be that you had to sign up for junk mail in order to complete the offer, but nowhere did it indicate that; I wouldn’t be surprised if even after signing up for at least one of the additional offers I still would not have received the sample. Nowhere did it indicate you will have to sign up for additional offers. I’ve also had two emails from them that made false statements (scare tactics) to get me to visit the site. One message threatened I would lose all my earnings if I didn’t log in and earn more Swagbucks by a certain time frame (which differed significantly from what is stated in their terms and conditions). 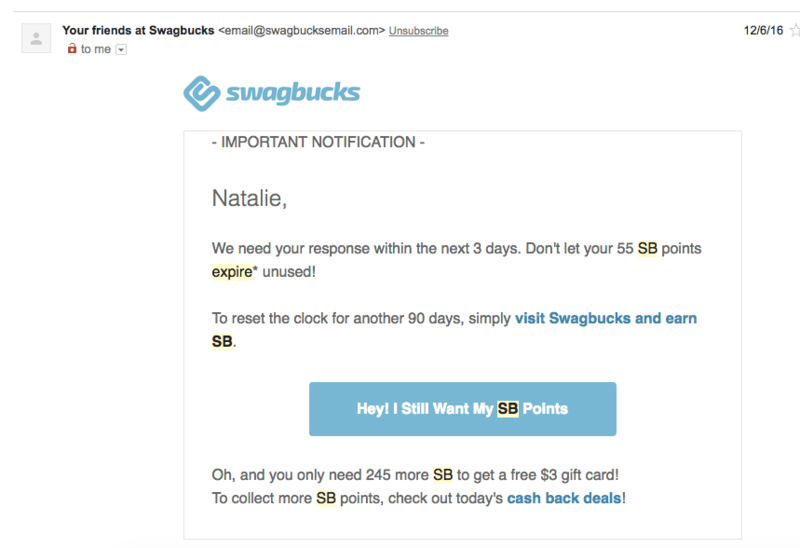 A Swagbucks representative also verified the message as providing the wrong information on their Facebook page. And yet, they continued sending me these types of emails. 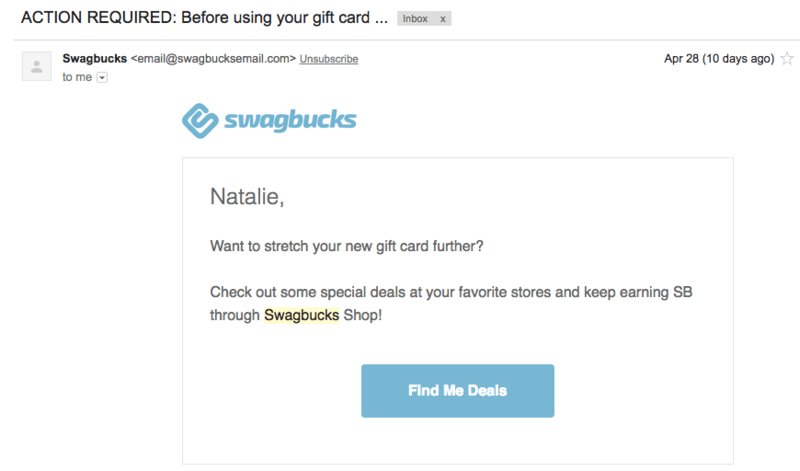 Another email indicated I wouldn’t be able to use my gift card, which I had just ordered with my SB earnings, unless I did something—it had as the subject line “ACTION REQUIRED: Before using your gift card …” but after opening the email, it simply said to check out some offers. Reservations aside, some of Swagbucks’ offers have been worthwhile for me—not as a way to generate income, but to get good deals (better than you’d get otherwise) on things like trials of services. For instance, I signed up for several trials via Swagbucks for Hello Fresh, Wen, ShoeDazzle, JustFab, Club W, Birchbox, Dollar Shave Club, It Cosmetics, Audible, and Degusta Box to name a few and ended up paying very little for each. I had to provide my card information and add a reminder on my phone to cancel the trials before being rebilled for the second month, but Swagbucks eventually came through on all of their offers. They recompensated me for the majority of the cost of each offer’s initial month. In some cases, I have also made a small profit—$5 with Birchbox and $5 for installing Mobile Xpressions, for example. Further, I occasionally use Swagbucks as a cash back shopping portal when the rate they offer for a merchant is superior to competitors such as Ebates and BeFrugal. Their referral program also currently pays 500 SB per person referred, in addition to 10% of their lifetime earnings. However, keep in mind that if you don’t earn Swagbucks for six months, you’ll lose any Swagbucks you’ve already accrued. Thus, it’s a good idea to cash out sooner rather than later. Once you’ve racked up 500 SB, you can redeem it for a gift card (I suggest looking for gift cards that are on sale). When it comes to Swagbucks’ money-making opportunities such as their surveys and watching video advertisements, it is a dreadful option. If you simply want to do something productive, you’re far better off finding a job in the real world or investing in your knowledge and skills, while attaining a degree and/or certificate to serve as concrete evidence to a future employer. If you aren’t making much at your job now and don’t have a baseline of education, it is crucial to be focusing on establishing it for yourself. And if you’re trading your time for money, it should be good money; even if you’re doing something else while performing two-cent tasks, your attention is being diverted and diluting your focus. Some more lucrative options for generating money I’d suggest include selling items lying around your home on eBay and Craig’s List, and marketing your skills on Fiverr and/or Upwork. You can also get a decent amount of money back on everyday grocery and drugstore purchases through rebate apps, my favorite of which is Ibotta. For its cash back feature and to get more attractive deals on trial subscriptions, Swagbucks is not bad. There are countless other sites of Swagbucks’ nature geared toward or that appeal largely to uneducated and unskilled people desperate for a little extra income, which you should think twice about. Like Swagbucks, they often have a referral program in place that provides motive for glowing, one-sided praise on the part of reviewers—if an affiliate link is present, there is a conflict a conflict of interest; in such cases, be wary of hyperenthusiastic descriptions. Whatever path you choose to take to earn, keep in mind your time is invaluable and your attention is limited. Spend it in a way that will truly enrich your life over the long term. If you’d like to try Swagbucks, please sign up using my affiliate link to help support this blog. If you’ve tried Swagbucks, do you think it’s worth it? What Are 7 Attributes That Public Adjusters Should Have?